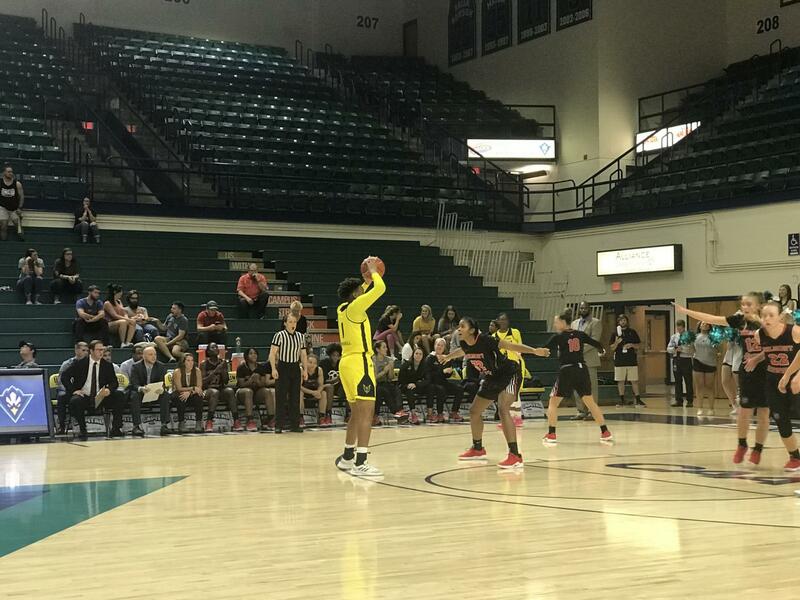 The UNC Wilmington women’s basketball team used big nights from GiGi Smith, Paige Powell and Lacey Suggs to earn a 74-58 opening night victory over Belmont Abbey at Trask Coliseum on Tuesday night. The win marked a successful start to year two of the Karen Barefoot era. Four UNCW players scored in double figures. Smith, a redshirt junior guard, led all scorers with a career-high 27 points. The former Old Dominion standout – who followed Barefoot from Norfolk to the Port City a year ago – was one of five debuting Seahawks on the night. Sophomore forward Powell notched her first career double-double with 10 points and 13 rebounds (9 offensive boards), and junior guard Suggs put up 16 points on 7-11 shooting from the field with four boards. Redshirt senior guard Shrita Parker, one of two transfers from Rutgers, added 10 points, five assists and four boards. “One thing I like about our team is we have depth,” Barefoot said in a press conference postgame. “I didn’t call any timeouts. I used my bench to go out there and help them lead, find ways, find answers, and it worked. It just shows me that they’re a team that really buys into ‘team first’. The teams were separated by only three points at the half, with a tough-shooting first half (37 percent) combined with foul trouble keeping the Division II Crusaders tight in the contest. However, the Seahawks became more aggressive on both ends in the second half and eventually led by as many as 17 in the fourth quarter. Powell gave thanks to her teammates and coaches for helping her reach her career night on game one of the season. Powell talked about also having to adjust her game personally as Belmont Abbey came out very aggressively in the first two quarters. Barefoot did not hesitate to state the importance of Powell’s performance in the postgame presser. Smith did not realize how many points she scored until after the game. She admitted that opening-night jitters may have gotten to her in the first half but credited her teammates for encouraging a next-play mindset. Suggs mentioned how the team’s closeness and chemistry have grown stronger of late and how it was a factor in their victory. Belmont Abbey, for whom the game was an exhibition tune-up, were paced by 17 points from sophomore guard Irelynn Davisson. Sophomore forward Allie Downing had 15 points with five rebounds while senior forward Manuela Fungate added 12 points and six boards. UNCW’s next game will be a trip to Athens, Ohio to visit the Ohio Bobcats on Sunday before returning home to play host to Presbyterian on Wednesday, Nov. 14 at 11:30 a.m. and Grand Canyon on Saturday, Nov. 17 at 1 p.m.